This week are trio are embarking on their first international lockdown, visiting Rose Hall in Montego Bay, Jamaica. The hall was home to the infamous “White Witch” Annie Palmer, who according to legend practiced voodoo, murdered her husbands, and took male slaves into her bed and subsequently murdered them. Ghost Hunters International took a shot at Rose Hall in 2010 and found no significant evidence, but maybe Zak can inspire Annie to give him some paranormal lovin’. The guys start off the interviews with Rose Hall’s manager Beverly Gordon, who offers them some “witches brew” to help them “feel Annie’s spirit.” She takes them on a tour of the house, giving them the details of Annie’s misdeeds. Annie would take pleasure from standing on her balcony and watching her slave lovers be whipped and tortured. Her three husbands were murdered in the house: one by poison, one by stabbing, and the last was strangled by her freed slave lover, who later murdered Annie herself during the slave riots of the 1830s. The guys then talk to owner Michele Rollins, who explains that Annie’s spirit was so feared that all her portraits were torn down and her concrete grave was marked by crosses to contain her ghost. The guys have an abysmal game of soccer against the hotel staff, which might have something to do with Aaron playing in flip flops. The guys are given an opportunity to tour the Cinnamon Hill Plantation House, former home of Johnny Cash. They will be the first team to investigate the location. Later, they take a culinary tour the city, sampling sky juice, coconut water, and jerk chicken. There is a minimum of goofing off this time around, which I hope means there is some serious activity in store. The guys start off at Johnny Cash’s house, which has been left the exactly as it was when he lived there. On the stairs, they start an EVP session but they don’t capture any audio. 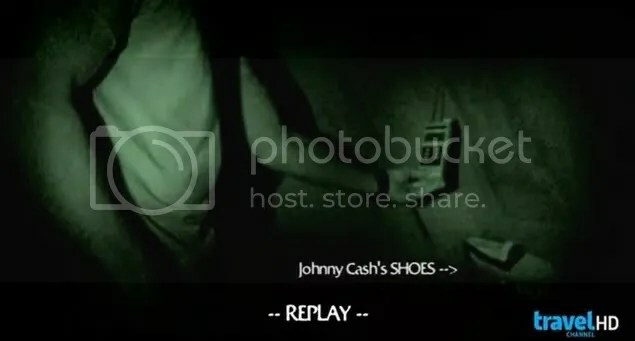 The EMF meter gives some spikes around some of Cash’s possessions, such as his alligator trophy and shoes. They move to the living room, where they try again to communicate with a highly calibrated digital recorder. Zak plays Professor Paranormal and tries to appear scientific by explaining that recording devices are more sensitive to sound than the human ear. With no audio captured, the trio head downstairs to the basement where they discover what looks like a jail cell and a legion of cockroaches. Zak flips the hell out, claiming that as a child growing up in Florida he was “severely traumatized” by cockroaches. Oh man, can we have some ridiculous b roll of that, please? They come to the conclusion the basement was used as slave quarters and do a quick EVP session, but they strike out on audio for the third time and end their lockdown. The trio moves on to Rose Hall to continue their lockdown. Outside, Zak likens the cricket noise to techno music and busts out into some rave dancing. Because of Annie’s liaisons with slaves, they bring along a huge security guard named Wilson to hopefully provoke the White Witch. Before they really begin investigating they notice a single set of bare footprints with no explanation. Wilson is directed to stand in the middle of a circle of REM pods, and almost immediately the devices start alarming, appearing to respond in an intelligent manner to questions. The guys head downstairs to review their audio with tech guy Billy, and they capture an EVP of a female voice saying “oh my goodness,” apparently in reaction to Wilson. Oh my, indeed. The trio spilt up, each taking a room where one of Annie’s husbands were murdered to conduct an EVP session. Nick and Zak don’t get any response, but Aaron hears a woman scream and his recorder confirms it. Aaron goes off alone to Annie’s grave, where he hears some footsteps in the woods. Meanwhile Nick and Zak stay in the house to do thermal sweeps and full spectrum photography. Zak captures what looks like a person but immediately debunks it. They end the investigation, and a talk with the groundskeeper reveals that the footprints could have come from a tour guide. Zak really is trying hard to seem serious, because for the first time ever, he announces their evidence is too inconclusive to prove a haunting. Apparently Zak wasn’t satisfied with the lockdown at the Cash residence, because he returned at a later date to investigate further. When asking if the spirits liked Johnny Cash’s music, he captured a voice that sounded suspiciously like Cash saying, “I do” through the spirit box. Voice analysis showed the voice was nearly identical to Cash’s. Very interesting. Despite a rich history, Rose Hall proved to be disappointing. 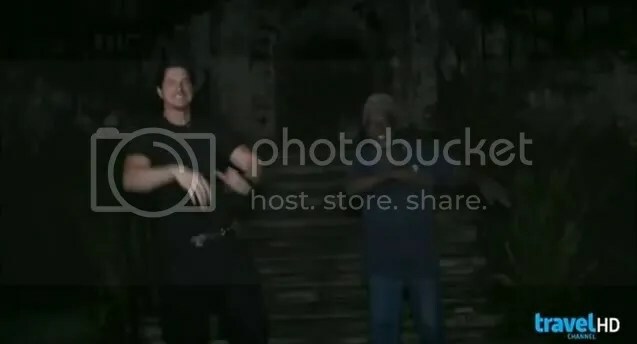 While I appreciate Zak’s attempt to be serious, part of what makes the show so entertaining is his unbridled enthusiasm for ghosts. If I want to watch a couple of guys taking a “scientific” approach to the paranormal, that’s what Ghost Hunters is for. Beverly Gordon – I’m taking you to Annie’s bedroom, where she seduced her husbands. Zak – Hold on, let me get a little buzz first. [Sips his drink] It’s very weird. Annie was very bad, evil. Zak – But I like her. Beverly – She would like you too. Zak – She always killed her lovers, the next morning, right? So if we chitty chitty bang bang tonight, I’ll be gone in the morning anyway. Beverly – I’m not sure you’ll get to leave. Are you good at chitty chitty bang bang? Zak – I think so! Aaron – He’s not saying that the other spirits aren’t intelligent. Zak – Like Aaron, he’s definitely not going to be an intelligent one when he goes. He’s the clumsy one, likes to make a lot of noises. You can see, we’re just funny people.